With heavy rain pounding much of Berkshire, riders arriving at Palmer Park were pleasantly surprised to find the stadium bathed in a small island of sunshine. However, with black clouds threatening, it was questionable just how much racing would be completed during the evening. First event of the night was the Senior B and Women’s scratch race. A relatively sedate start led to Richard Gostick (Reading CC) making a break after just a lap. However, with 13 determined riders remaining in the peloton, Gostick was able to sustain his lead only for four laps. The group remained together until a five-man break led by Joshua Mitchell (Bicester Millenium CC) with four laps to go. Even this relatively large breakaway was not able to stick and, with a lap to go, it was obvious the final positions were going to be determined in a sprint finish. 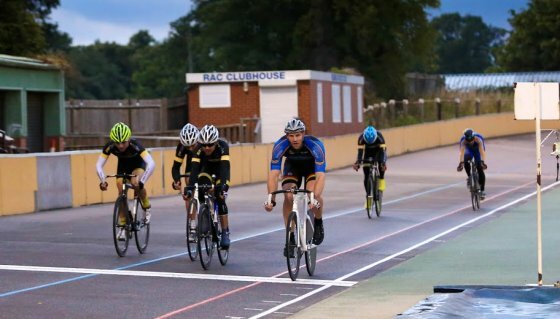 Ten riders started the Senior A scratch race and, with a fast pace being set from the gun, it took eight laps for the first break to be made. It was Nick Abraham who made this solo break, but he was unable to sustain this for more than a lap with Nick English (AW Cycles) leading the chase back to him. 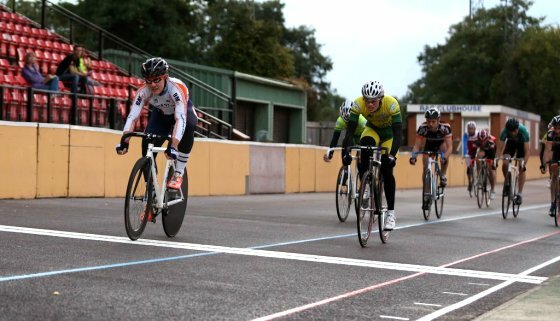 However, with riders finding the track slippery on the first bend due to the poor weather, most elected to wait until the final bend to make their charge for the line. This culminated in a fast sprint finish which was won by Neil Rutter (Cotswold Veldrijden), with Max Stedman (AW Cycles) narrowly edging out team-mate George Withers for second place. 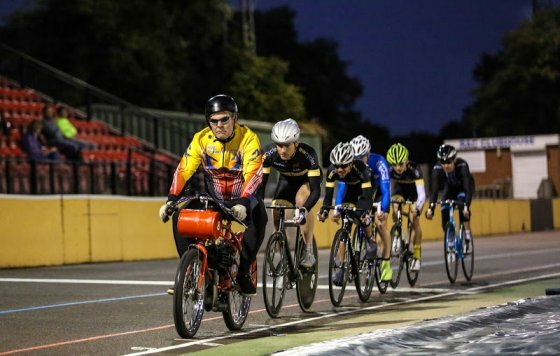 Although the Keirin heats were started, the clouds which had been threatening all evening quickly engulfed the track and torrential rain forced the meeting to be abandoned immediately.